"Once again Clocktower bring you the massive and powerful tracks, such as 'Cloak & Dagger' DJ style led by King Tubby and Lee Perry. And they've also included the slow style of 'Cloak & Dagger' which you will never stop listening for generations to come, young and old. Then the following tracks of 'Blackboard Jungle' with two incomparable versions that will open up your ears to the greatest musicians on bass and drums, etc. We from Clocktower say listen, enjoy, party, and dance to all the fine production. We have compiled this for all who loves reggae music production beyond compare. Music of life." --Alfred Newman Not a reissue, a new compilation of early Lee Scratch Perry material, not previously issued in this form. With tracks recorded from the early '70s with material from Clocktower 7" only releases, etc. LP version. 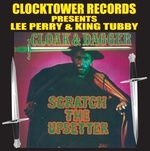 "Once again Clocktower bring you the massive and powerful tracks, such as 'Cloak & Dagger' DJ style led by King Tubby and Lee Perry. And they've also included the slow style of 'Cloak & Dagger' which you will never stop listening for generations to come, young and old. Then the following tracks of 'Blackboard Jungle' with two incomparable versions that will open up your ears to the greatest musicians on bass and drums, etc. We from Clocktower say listen, enjoy, party, and dance to all the fine production. We have compiled this for all who loves reggae music production beyond compare. Music of life." --Alfred Newman Not a reissue, a new compilation of early Lee Scratch Perry material, not previously issued in this form. With tracks recorded from the early '70s with material from Clocktower 7" only releases, etc.